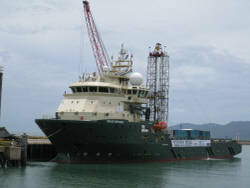 Integrated Ocean Drilling Program (IODP) Expedition 325, designed to investigate the fossil reefs on the shelf edge of the Great Barrier Reef, was the fourth expedition to utilize a mission-specific platform and was conducted by the European Consortium for Ocean Research Drilling (ECORD) Science Operator (ESO). The objectives of Expedition 325 are to establish the course of sea level change, to define sea-surface temperature variations, and to analyze the impact of these environmental changes on reef growth and geometry for the region over the period of 20–10 ka. To meet these objectives, a succession of fossil reef structures preserved on the shelf edge seaward of the modern barrier reef were cored from a dynamically positioned vessel in February–April 2010.